Here are some more examples of how the ProtoysUSA designed Charlie Toy fairing has helped so many motorcycle racers and riders reach land speed world records never before possible. The facts speak for themselves, the Protoys bodywork is found on nearly every motorcycle that is breaking records these days. There's a guy named Charlie Toy that designed, in cooperation with a another racer or two (Correction: The Charlie Toy fairing was the sole design of Charlie Toy and Protoys Raging. Natural collaboration in conversation occurs through any race effort but this design was NOT the result of any sort of partnership No one but the friends and family of Protoys Racing can be attributed to its design or construction) , a fairing that's pretty aero efficient. Kent Riches (AirTech) has the molds and makes the fairings for us racers -- and the easy nomenclature for said fairing is a "Charlie Toy" fairing. Here's photo of my bike with the fairing -- a few others are running the same body, and more are running the tail section only with their own front pieces. Al Lamb's [ProtoysUSA - CHarlie Toy Body Faired] 265MPH Bonneville Run - *AMA/ FIM (claimed) Fastest Motorcycle In The World - Sit On (Average Record Speed 263mph) 2012 from COLORFULgrey Zach Settewongse on Vimeo. "Sit-On" Motorcycle Land Speed Record. Comment: Team Subtle Crowbar has returned with 2 LSR records after a great week at the 2008 USFRA World of Speed. We ended up running in a APS-1000-PG , the record in that class was 161.050 , we met our Bonneville goals with a qualifying run of 171.246 averaged over the mile and backed it up the next morning with a average 170.467 run for a total average of 170.856 mph. Our first Bonneville record, and almost 10 mile an hour faster than the previous record set in 2000! BONNEVILLE SALT FLATS, Utah – Longtime racer and dealer principal Al Lamb made history late last month at the Cook Invitational Shoot Out with a two-way mile average speed of over 262.47 mph, setting the new AMA/FIM World Record. 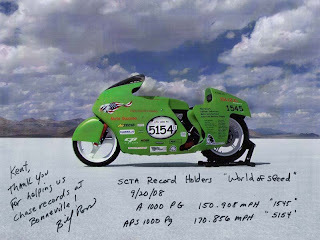 Lamb, owner of Top 100 Dealer Dallas Honda, celebrated his triumph on the heels of achieving the top motorcycle record in August during SCTA Speed Week at the Bonneville Salt Flats with a record of 240.2 mph in the SCTA MPS1000BF class. He continued the charge with another goal-setting run during the BUB Motorcycle Speed Trials at the Bonneville Salt Flats with the event’s top speed. The new world record was realized on No. 1979, a turbo-charged Honda CBR1000RR designed and tuned by the Dallas Honda Race Team, which included Trevor Weilor from Honda Racing, crew chief and head mechanic Todd Wright, mechanic support Alan Frosch, and programmer and electronics guru Eric Schieb, all sponsored by American Honda Motor Corp.
Honda CBR 1000 RR has just broke the new speed record in class engine capacity of 900cc. This Motorcycle 999 cc engine reaches speed 426 km / hour.